What should you know before moving to New York? HomeWhat should you know before moving to New York? Exciting times ahead! You’re about to move to the Big Apple. Moving anywhere is quite an adventure and moving to New York is more than that. It’s called The City That Never Sleeps for a reason. It’s where the most driven, the most ambitious and the most determined people flock to pursue their dreams. Here are some things you should know before you take that huge step that will change your life forever. Moving to New York gets to be a very intense experience for most people. They say New York has it all. Well, that’s not entirely true. One thing you’ll never find in this city is silence. No matter if it’s day or night or what day of the week is – you’ll be hearing traffic noise, honking horns and people shouting all the time. No birds singing or silent moments. At all. Your only escape could be a pair of noise-canceling headphones. Unlike everywhere in the US, where you use your car almost all the time, you get to walk a lot in New York City. Now, it’s up to you to enjoy it or hate it. If you’re a fan of walking, you’ll be thrilled and burn some calories along the way. If you’re a hater, you might reconsider your decision to move to New York. Just kidding. This experience is not to be missed. This is another reason why you don’t need a car while in New York. Or is it the other way around? Cars are proven not to be a great means of transportation in the Big Apple, so people opt for what they have and it’s the subway. Anyway, it’s the way to go after you have moved to New York City. If you’ve come from California, you’re not going to get used to this quite easily. But at least you’ll know from now on what the term “freeway” means. There’s no freeway on the East Coast and wherever you need to go by car expect to pay tolls. Tunnel tolls, bridge tolls, expressways, parkways, you name it. And the bigger your car, the higher the toll. So keep that in mind if you plan to have a car in New York City. And if you do, go for an E-Z Pass. If you haven’t been before, go and see it and then decide if you want to come back. Many residents in the city avoid it at all costs. The intersection of Broadway and Seventh Avenue is known for its bright lights and street performances, but also for hectic crowds, beggars and some more annoying people as well. This does not apply to the subway only or to Times Square. It more or less applies to every street and every public space in New York City. No way to avoid it, you can just deal with it. It all comes along with moving to New York. Rents are so high. In spite of all great things, there are moments when moving to New York doesn’t seem like a very good idea. Each neighborhood in Manhattan is unique and has its own subculture. Since commuting across the city is not easy at all, people mostly stick to their part of town. If you’re looking for a quieter environment (not a quiet environment, remember there’s no such a thing in New York City! ), check the Upper West Side. If you’re young and not so quiet, check East Village, Chelsea, Murray Hill and Greenwich Village. Whichever you choose, expect to be labeled as an East Sider or a West Sider. Every neighborhood in New York is unique. That is, unless you move to the suburbs. But while you live in the city, forget about saving or paying back your school loans. The high sales tax in New York will make your regular grocery shopping feel like a lavish experience, moneywise. It’s the same when it comes to going out for a coffee. Moving to New York will pretty much turn your life upside-down. If by some chance you can survive on pizza, you’ll be a rich man. There are many locations across the city charging $1 for a slice. And it’s a slice of the best pizza in the world or at least that’s what New Yorkers will tell you. The Big Apple is proud of its pizza, bagels, and donuts. Not the healthiest options out there though, but still something you can’t imagine moving to New York without. But at least there are fruit and vegetable stands on every corner. You can order food from any restaurant in the city or get anything else delivered straight to your door. Just use Postmates, Seamless, Instacart, Fresh Direct or Amazon. While it’s so convenient, it’s not the cheapest option to live by. Consider cooking sometimes as well. On top of enjoying the very experience of spending time in a park, you can also use free WiFi over there. A great option if you want to just sit outside and work. That is, you get that best view from the Staten Island Ferry and that’s free. 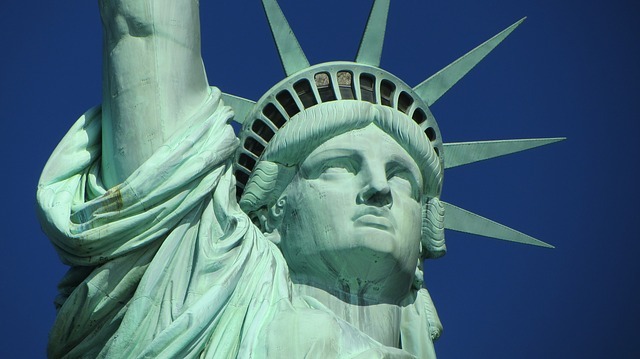 Statue of Liberty is a true symbol of New York. Visiting various NY neighborhoods feels almost like traveling the world. Little Italy, K-Town, Little Ukraine, you name it. People coming from other states also have their meeting points. Just ask around and you’ll find bars for natives from every state. They also gather over there to watch their local team’s games. Escape to Long Island or Upstate New York for a breath of fresh air, both literally and figuratively. Moving to New York City is such a unique experience. It comes to the point that newcomers sometimes feel as if they’ve moved across the world, not just to another state or another city. But rest assured, anyone adapts quite easily if they want to. New York is a city that welcomes everyone with open arms!